Romance rules the world they say, and in all the dynasties that have ruled across the world, there is usually a secret and hidden story of passion that cannot fail to enthrall us. Now that the story of Baji Rao and Mastani has been successfully filmed, most people know the story, but one wonders how many are aware that the Raja Dinkar Kelkar Museum in Pune, created to house a splendidly displayed collection of items of every day useage, also devotes a whole wing to a section of the mansion built by the besotted Peshwa Baijirao, for his talented and stunningly beautiful wife Mastani. This was a romance that simply had to find its way to Bollywood. In fact at the time I visited the Museum about a decade or so ago, I wondered why this story had not already hit the big screen. The reconstructed part of the Mastani Mahal lives on in the Museum, as a tribute to the grandeur of a bygone era and a reminder of one of the great romances of our land. Peshwa Bajirao the first, a descendent of prime ministers who served Pune’s rulers including Shivaji, later succeeded him as rulers of the region. Mastani was given to him in marriage, by her father Raja Chattrasal of Bundelkhand, after the Peshwa helped him when enemies attacked his small kingdom. Mastani — was a woman of legendary beauty and talent — an accomplished singer and dancer whose translucent skin was likened to the finest pearl and her mouth to the red of a pomegranate seed. Baji Rao was totally captivated. Unfortunately their romance was doomed from the start and moved to its sad and natural end. But while it lasted, it was the stuff of dreams, and the city of Pune the background to this great romance. Versatile ever-changing Pune, Maharashtra’s second largest city, has so many contradictory facets: Brahminical othodoxy, to some revolutionary ideas of freedom, of old styled ‘wadas’ (traditional mansions of older times), standing cheek by jowl with modern glass structures. The Peshwas of course did not build Pune, the city is far older than the almost 300-year old dynasty. The city has a more or less unbroken history having grown from Shivaji’s ideological capital to that of the Peshwas. Here you can see grand old buildings built for pleasure such as the ‘Vishramwada’ (literally translating into a mansion for relaxation) to the temples that this family of hereditary prime ministers built all over the city. This combination of prudery with an apparently explicit surrender to pleasure is yet another of the city’s contradictions, of which its citizens strangely appear to be perversely very proud. Among the temples built by the Peshwas is the moated Saras Baug Ganesh Temple, located in the green expanse of Peshwa Park. The Parvati Temple located on the outskirts of the city is located on a steep hill and draws a great many pilgrims — despite the fact that there is no other way to reach the top, except on foot. It is said that the last Peshwa ruler stood at the hilltop and sadly watched his kingdom vanish, as his troops battled, and were defeated by the British, at the famous battle of Kirkee. The Peshwas themselves did not originate from Pune. The patriach, Balaji Vishwanath Bhat, crossed the ghats from the Konkan to become the first Peshwa (or Prime Minister) in 1707 for the Satara-based King Shahu and found prosperity and ever-lasting fame in the fertile land of Pune. Establishing their rule in the region, the Peshwas illustrated the intelligence and fearlessness that they had used in helping and guiding their erstwhile rulers, who included the fearless Shivaji. Under the Peshwas the region grew in importance and wealth, till they were defeated in battle by the British. Peshwa Balaji Vishwanath was succeeded by his son, Baijirao I, a brilliant cavalry general, and a romantic at heart. Today one building stands mute testimony to his rule - the Shaniwarwada, a palace built by Baijirao I in 1736 located in a section of the city, where winding roads form a virtual maze. While the palace interiors were burnt down in a massive fire in 1827, and are totally gone, the fortified walls and large brass-studded gates with menacing spikes designed to ward off elephants, and the 18th Century lotus pools and the elaborate foundations of the palace, still survive. There is a pleasant garden inside the walled enclosure, and signs announce where rooms earlier stood. A fine equestrian statue of its builder, stands proudly in front of the building. The saga of the Peshwas is replete with all the ingredients necessary for a best-selling romantic novel, including intrigue, internal bickering, even open revolt. 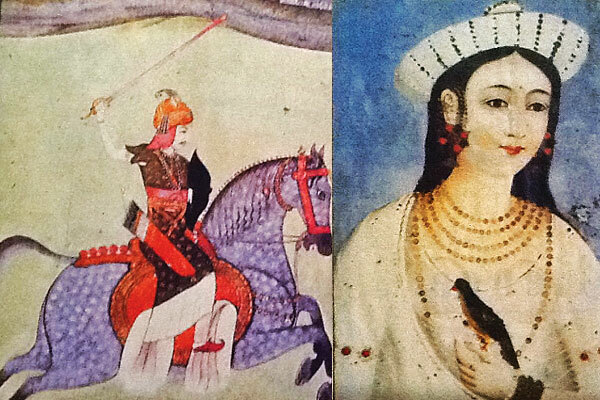 In Baijirao I’s ill-fated love affair with his Muslim wife Mastani, religion played a major part in their problems. Despite the love that Bajirao and Mastani shared, they both knew there was no future for them and that sooner or later, it would have to end. Regardless of what other’s had to say, Baijirao, created a beautiful palace for his beloved, in which terracotta painted walls, embellished with themes from the Krishna Leela, were drawn with the finest strokes, in white. The wooden ceiling was intricately carved and supported on equally ornate carved pillars. Imagine the scene — wonderful crystal chandeliers lit up the palace, and as the Peshwa dressed in his fine silks, relaxed against gold embroidered velvet cushions, his beloved Mastani, played on the tanpura, lifting her melodious voice in song. These two did not need anything more, to make their happiness complete. But as in traditional film scripts, their luck had to run out, and duty and honour, and political and court intrigue haunted the lovers at every step, bringing an end to this idyllic relationship. We have Raja Dinkar Kelkar to thank for having the vision to save this invaluable part of history, before it faded away into oblivion like so much else in the city. In fact, considering the city’s historical background, it seems strange that there is so little left to see. By including a part of the Mastani Mahal in his beautiful museum, Kelker ensured that this great romance would continue to enthrall future generations. Visitors marvel at the well preserved painted frescoes on the walls and the ornate pillars and ceilings. Baijirao’s velvet gaddi, and Mastani’s tanpura—now mute and silent—bear testimony to a tragically romantic and colourful chapter in Pune’s history.